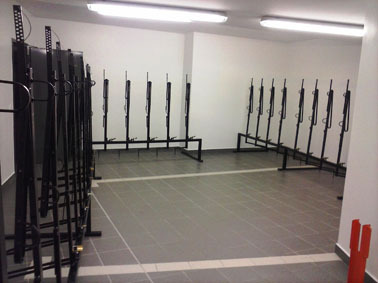 Shipping worldwide, scroll down for price list ! 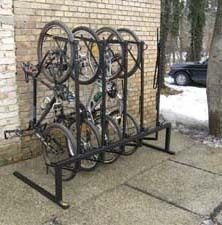 Bicycle parking racks or storage vertical stands are made in units with capacity from one to five and endlessly extendable. 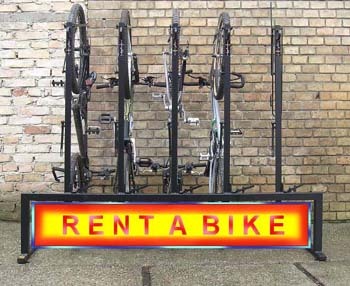 Suitable for safely storing bicycles in garages, gardens or houses front and back yards. 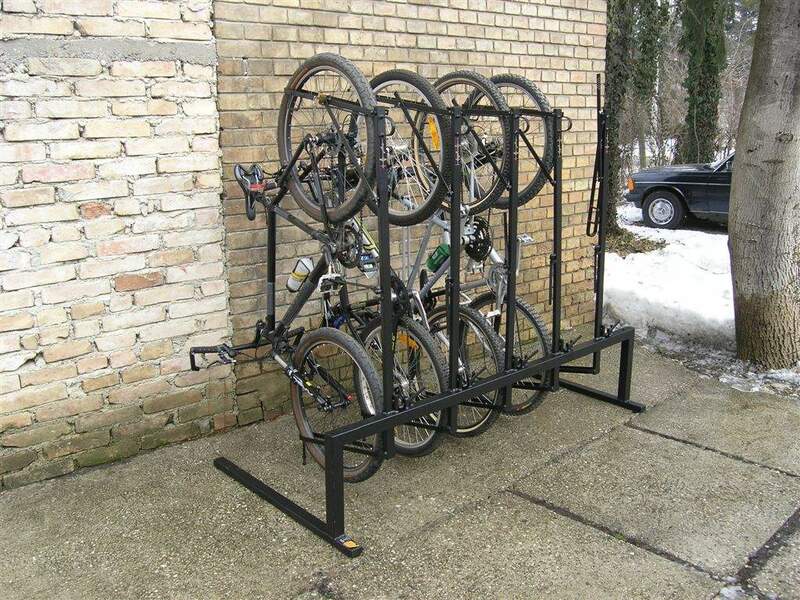 Such bike rack system is very convenient for placing: in front of houses, shops, post offices, banks, companies, factories, schools &colleges, cafe bars, restaurants, pansions & hotels and car parks. 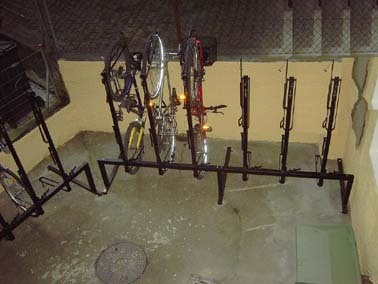 Bicycle parking rack is stable and self-standing device with possibility of fixing it to the ground. 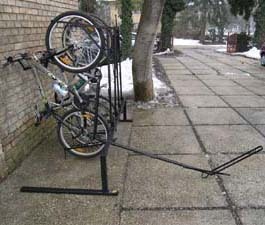 There are three possibilities of bicycle theft protection. 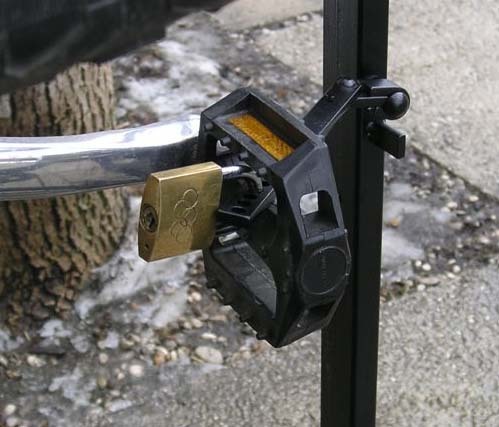 When parked, bicycle is secured with standard pad lock or pad locks. 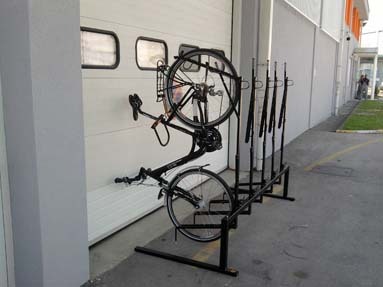 There is also an option, to secure bike on rack with usual conventional anti-theft equipment in case of lack of pad lock. 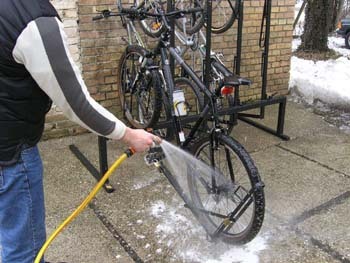 Very convenient bicycle support for bike-washing and bike-maintaining. 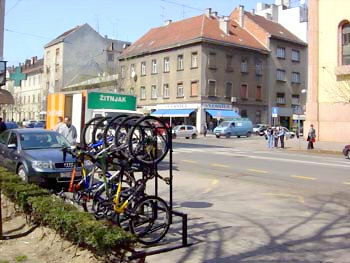 Safe bike parking, every town needs. 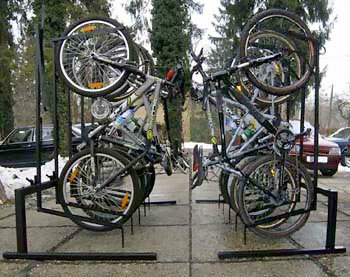 No one want to see this Bike Parking scenes, ever again! 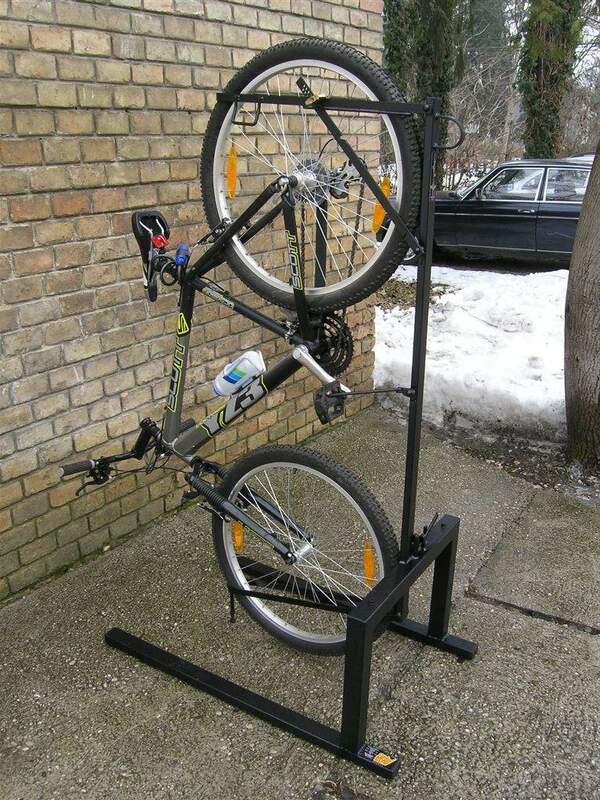 Solved family bicycle problem. 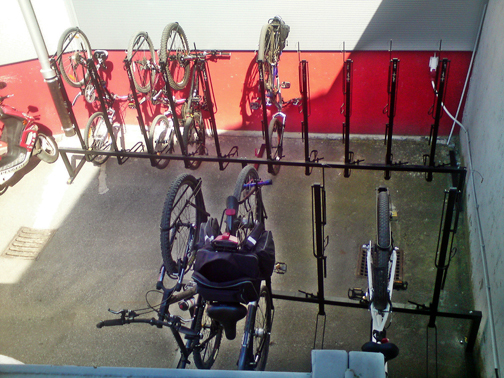 Seaside is crowded with bicyclists. 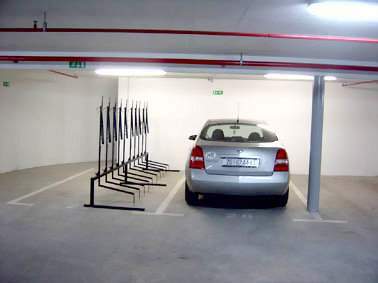 10 bikes - 1 car park space. 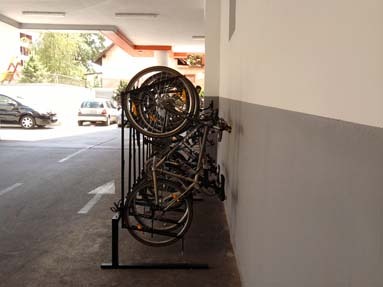 for safe bike-park. 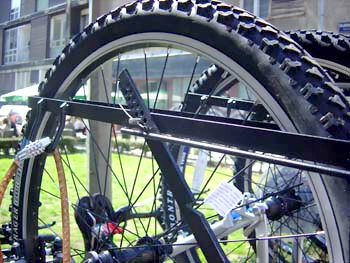 Locking bike in the Securing bicycle pedal. 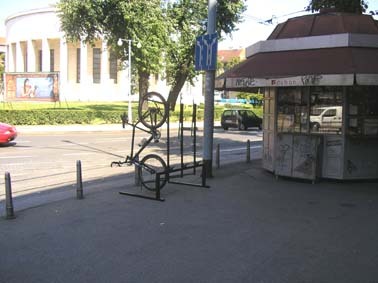 Locking bike rack ramp. 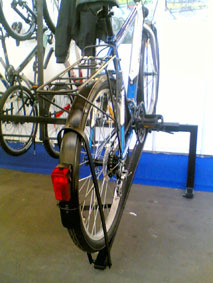 Securing bike with chain. 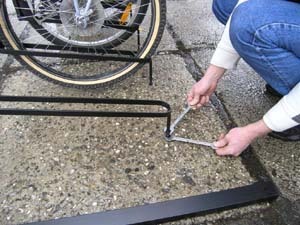 Adjusting vertical position of bicycle ramp. 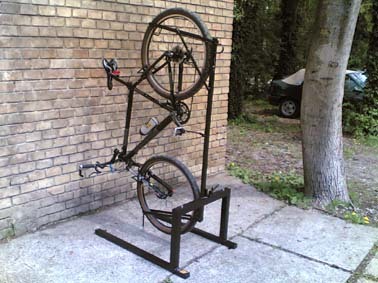 Stand-rack for 1 bike. 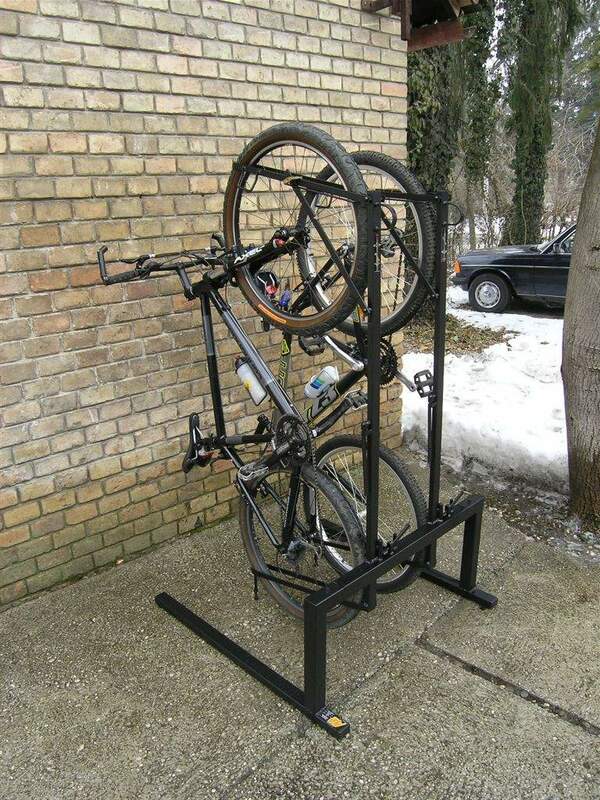 Stand-rack for 2 bikes. 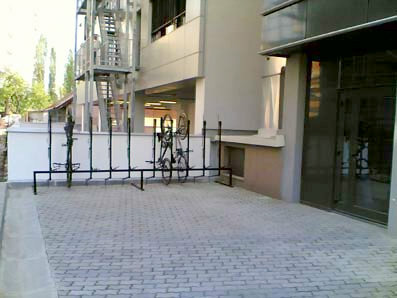 Lifting bike up. 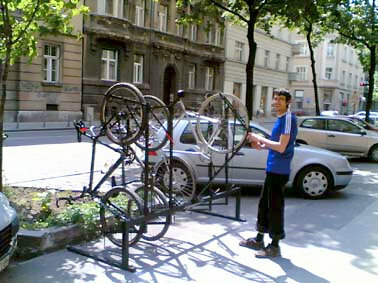 Releasing bicycle ramp safety pin. 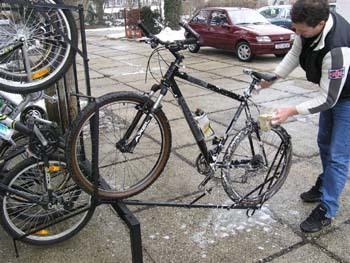 It gives a great pleasure to keep bicycle clean and serviced. 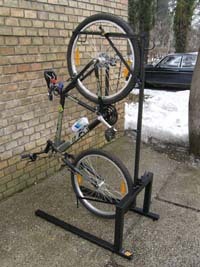 EU shipping price 99€ for units up to 10 bikes capacity ! 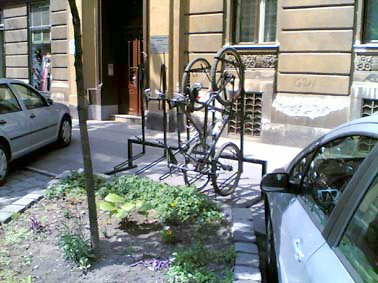 In any combinations, bike parking unit needs one leg for each side. Seeking: representatives - distributors - manufacturers, world wide. 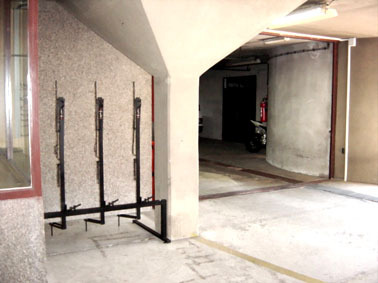 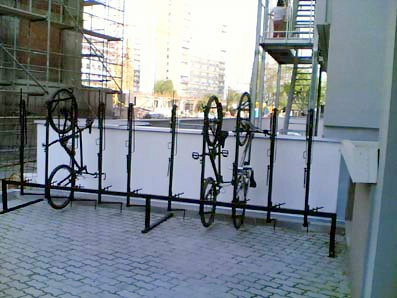 This vertical bicycle parking project is unique in the way that bicycles are stored or parked, secured and lifted in vertical position. 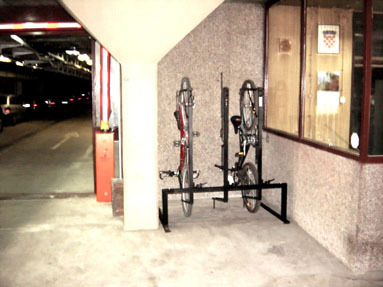 When designed, all word's bicycle parking requirements and regulations have been taken in consideration: support the bicycle without risk of damage, enable bicycle’s both wheels and the bicycle frame to be locked, bicycle parking to be as close as possible to the cyclist's destination, bicycles being placed in public view, bicycles being maximally protected from theft, protect bicycles from weather where possible, bicycle holders being clearly signed where necessary, bicycles easily accessible, pose no hazard to pedestrians, bicycles parking well lit if used at night, bicycles being protected from encroachment by motor vehicles, and occupying the minimum space. 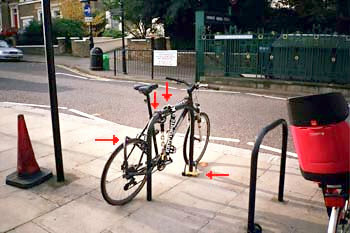 When placing bicycle on device, both wheels (touching pneumatics only) are locked in sandwich between wheel frames, bicycle is secured with one, two or three standard padlock. 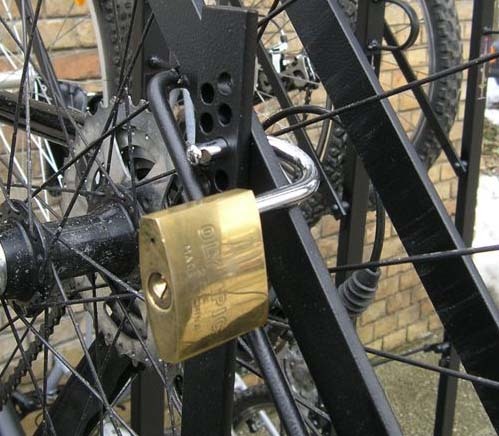 One padlock will secure the wheel frame sandwich, second padlock will additionally secure bicycle on device by locking pedal to the unit and third padlock will lock the bicycle ramp in vertical position. 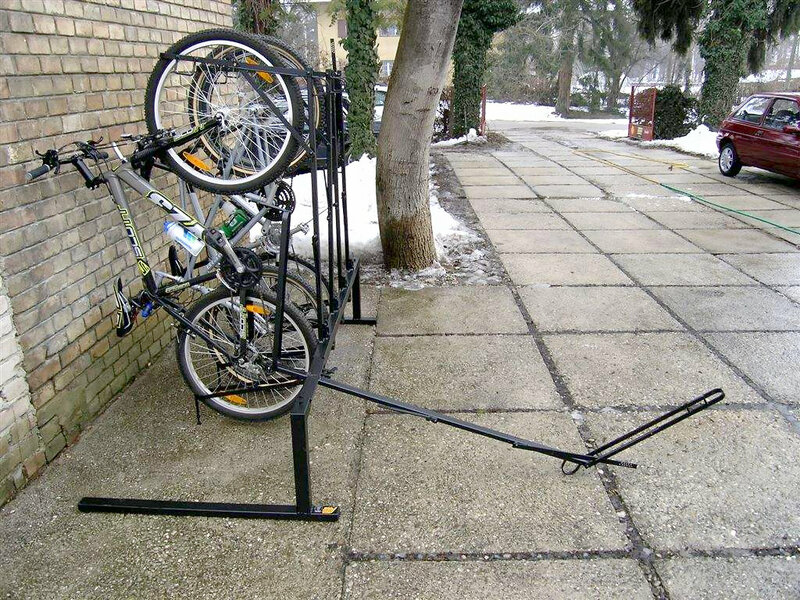 Such security wills definitely unable theft of bicycle or its wheels. 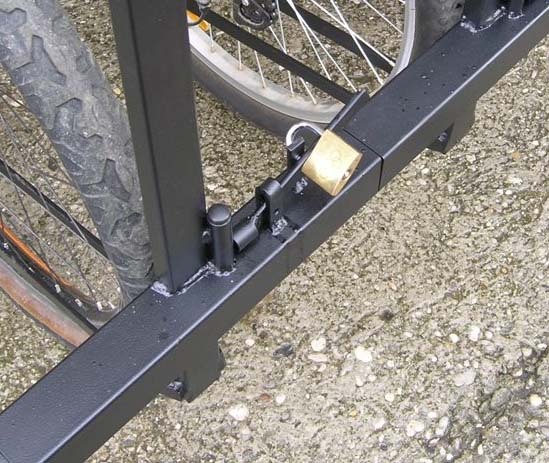 Beside this, there is possibility to use conventional bicycle securing chain instead of padlock or use it as additional security. 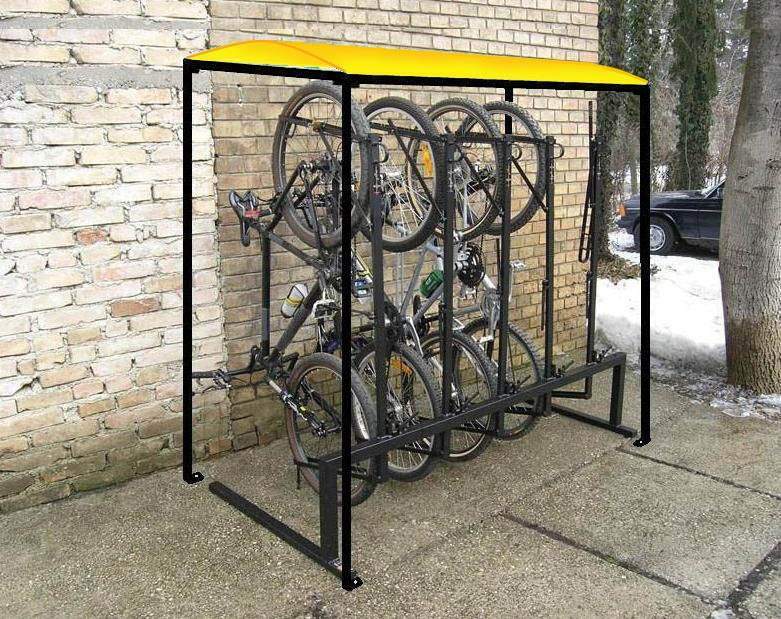 The way, that bicycle is placed and fixed on device will save the bicycle of possible damages either when positioning it on device or during the time of bicycle storage or parking. 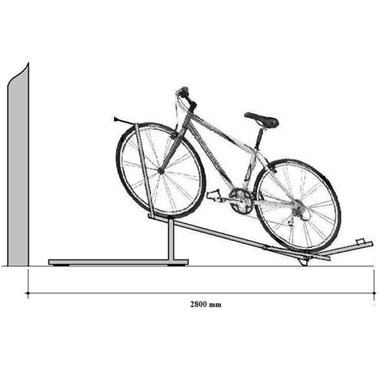 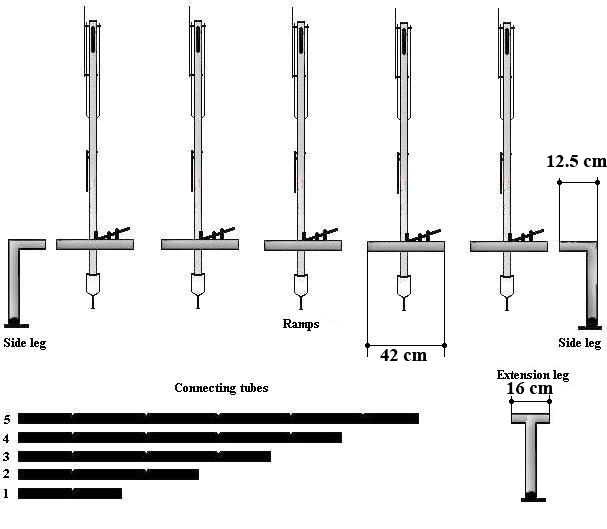 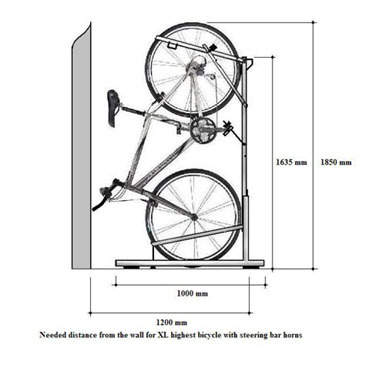 Lifting bike up when positioned on device up to 80% of space is saved comparing to the any known bicycle parking system with both wheels on the floor. 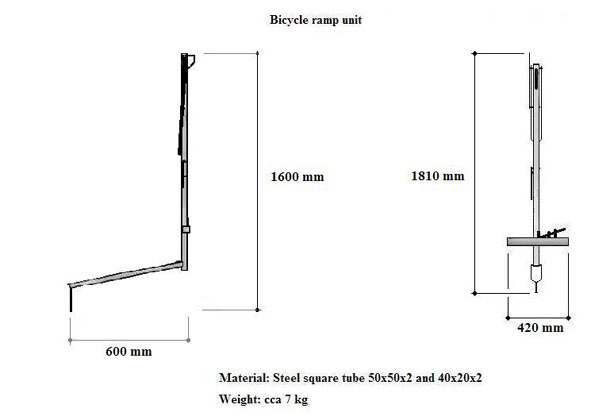 It is important to mention, that lifting bike up together with device ramp, does not require any effort. 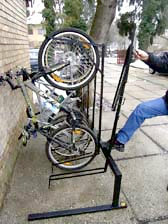 Consequently, children and women can easily lift it up. 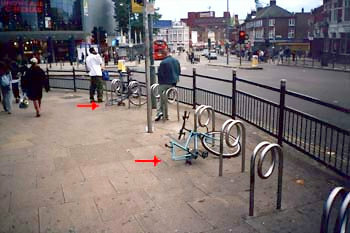 Placing bicycles with front wheel forward and next one with rear wheel forward (ramps are labelled), additional space is saved. 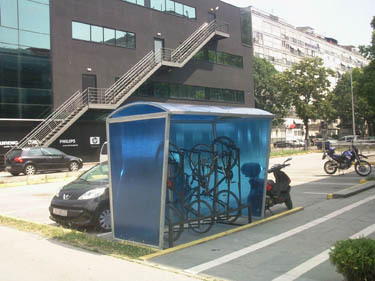 So, comparing with Bicycle Box Parking systems, which are mostly used systems in the world, 80% of space is saved. 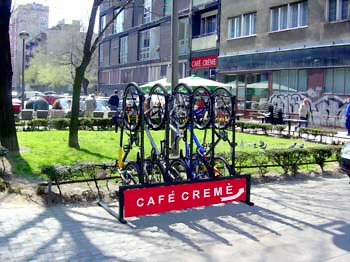 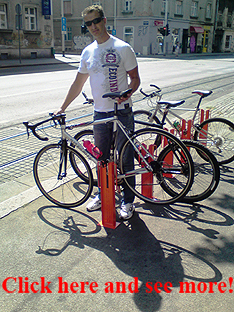 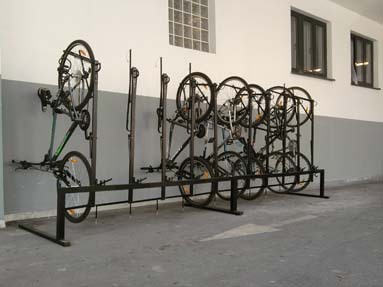 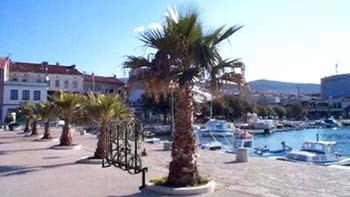 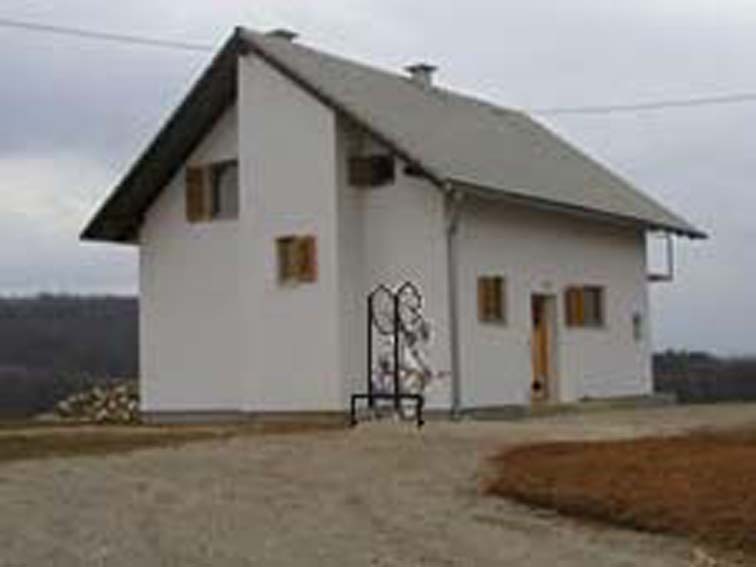 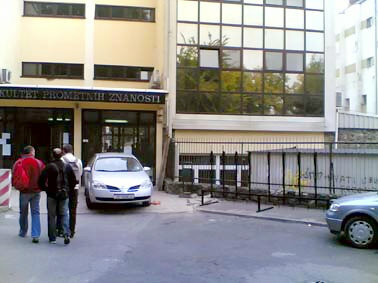 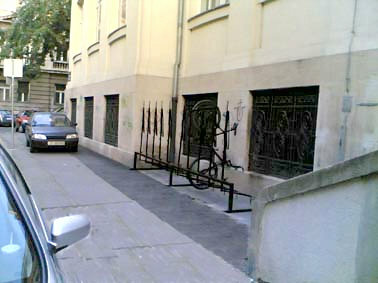 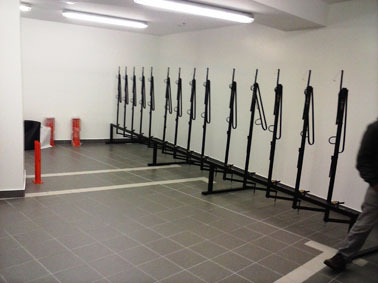 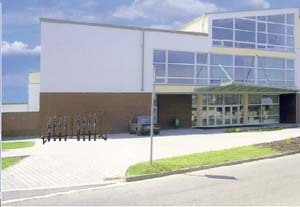 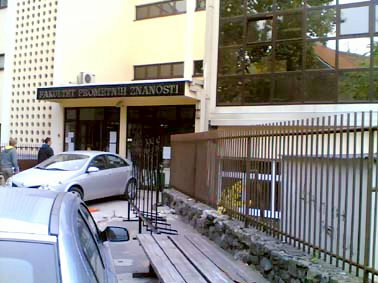 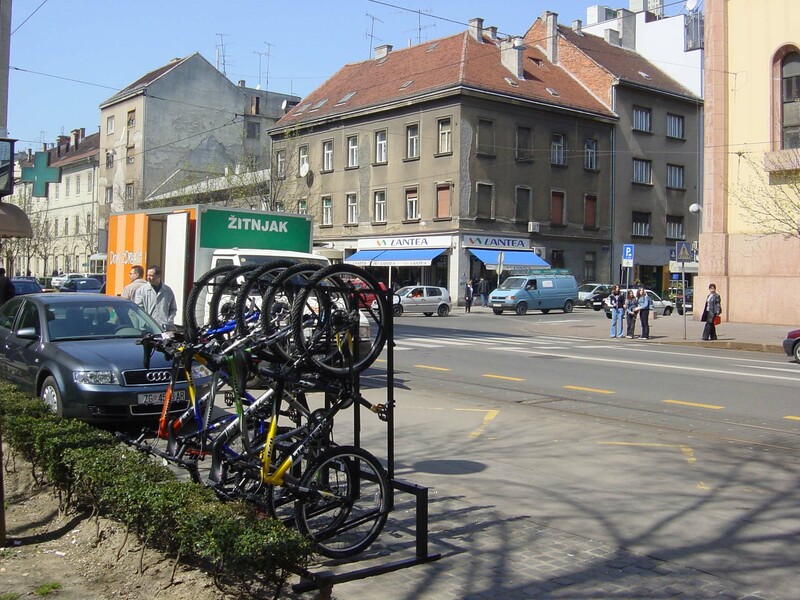 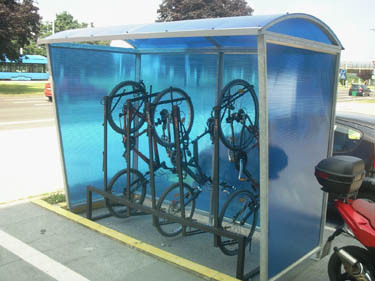 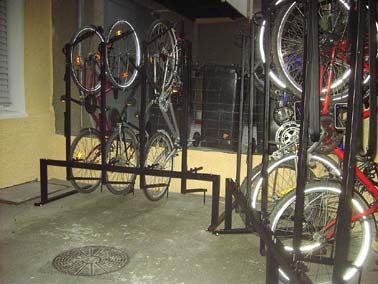 Namely, Bicycle Box Parking system for ten bikes, occupies 20 m2, while this bicycle parking system occupies only 4.2 m2. 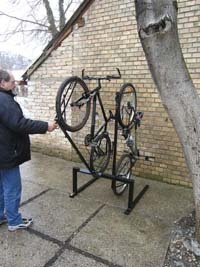 This bicycle parking unit is compact self standing system and could be moved easily from place to place. 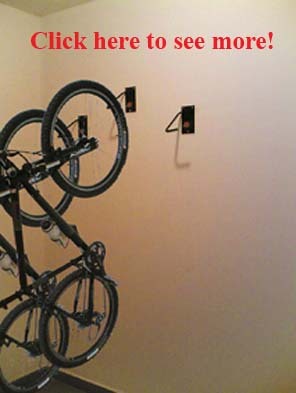 On the other hand, it can be fixed to the floor with bolts. 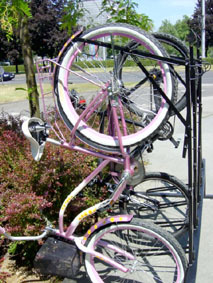 Units can be assembled for one, two three… bikes. 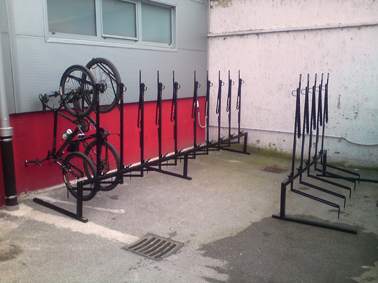 For big bicycle parking places, units can be extended endlessly. 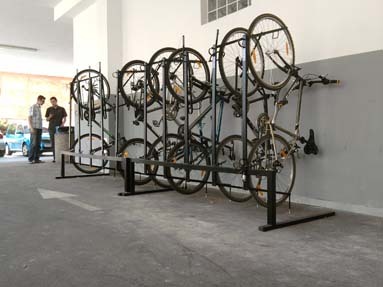 There fore, these parking systems are suitable for anyone, from single bicycle owners to big Bike Parks. 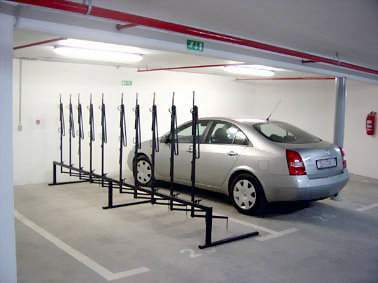 Vertical Parking Device is made of steel and powder coated. 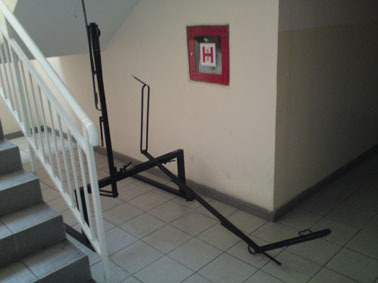 With such treatment of steel, durability of this device can be measured in decades.